Jessica Macaulay of the UK dives 18 metres at the Snakehead on Islet Franca do Campo during the first training session of the second stop of the Red Bull Cliff Diving World Series at Sao Miguel, Azores, Portugal on July 7th 2017. The Red Bull Cliff Diving World Series will be heading to Dublin in 2019 after the Irish capital’s Grand Canal Dock was selected as one of the venues for this year’s competition. Inis Mór has previously staged the event on three occasions, but this will be its first time travelling to Dublin. They won’t be alone as a newcomer, either, after the Cliff Diving World Series announced El Nido in the Philippines and Lebanon’s capital, Beirut, as the other first-time hosts. Briton Gary Hunt is a seven-time men’s champion in the World Series and currently holds the title after taking back the gold in 2018. 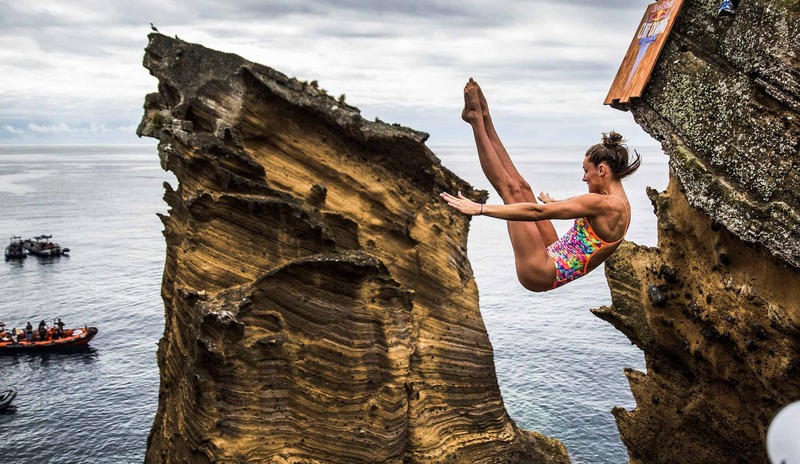 Australian Rhiannan Iffland has won the women’s crown the last three years running and could become the first athlete to win four successive titles in 2019.